Starting June 10th, Fr. Charlie Sumners will be presiding over worship services for the month of June at St. Peters in Lago Vista. The Rev. 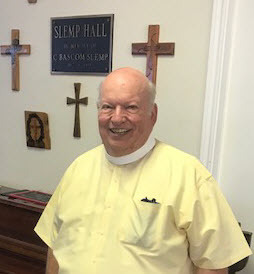 Charlie Sumners ordained to the Diaconate by Bishop Scott Field Bailey in 1967 and served as an assistant at St. Patrick's in Washington, DC from 1967 to 1970 and then at St. John's Bethesda, Maryland until 1972. He joined the staff at St. Luke's, Atlanta in 1972 and served there until 1978. While there he served as a Liturgical Missioner introducing the 'Folk Mass' style of worship to parishes throughout the South. He moved back to Texas and became the Rector of St. Philip's in Beeville, Texas in 1983 and retired in 2000. He began a series of short-term 'permanent supply' assignments in Texas and Colorado. Most recently, Reverend Sumners was Priest in Charge of Grace Church in Cuero, Tx. from 2014 to 2017. While maintaining a base in parish ministry for over 50 years, he has been able to specialize in music, media, and communications. He has been married to Robin Sumners since 2000 and between them have six living children. Robin is a graphic artist and writer. The Reverend Sumners has been a pilot since college and he is active in the Civil Air Patrol.